Annunciation, by Fra Angelico, 15th c.
A blessed solemnity of the Annunciation, which commemorates the central feast of the Incarnation – the Word made flesh – the conception of the Son of God in the womb of the Blessed Virgin, freely chosen by the young Hebrew maiden Mary, who was given a choice to make: Fiat mihi secundum verbum tuum, which should also be our response to anything manifested as the will of God, whether through an angel, or any of the ‘messengers’ of providence whom we may meet in our daily journeys. 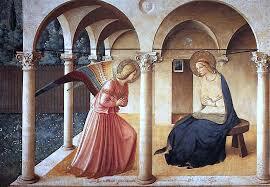 As Saint Augustine wrote, Mary conceived Christ in her heart before she conceived Him in her womb. Tradition holds that Mary was a virgin, consecrating herself by vow, thus, in all expectation, foregoing her ‘chance’ to be the mother of the Messiah. But God chooses in a way that is not always in accord with the ways of men, and does the unexpected, through the lowly, the meek, the humble, and those who trust most in Him. For the apparent wisdom and strength of the world are not His wisdom and strength, which far surpass anything we could think or hope. Such was the import of this day that when Dionysius Exiguus reformed the calendar in 525 A.D. – well, what we now know of as that date, for it was he who came up with the whole ‘anno Domini’ classification, now sadly reduced to the bland, agnostic ‘C.E.’, about which the less said the better – the monk had the new year begin on this day, a custom that held in England until 1752. Better, it seems, than having one’s year begin on a month dedicated to a two-faced pagan god in the depths of bleak winter. For it was on this day that the new era of grace and redemption begin, when our salvation truly is at hand. And, to add to this supernatural truth, the vernal equinox brings a beginning of new life, of warmer climes and sunnier days, to warm wintry hearts with hope and promise of future good things. As the angel Gabriel said to Mary, ‘you shall call his name Jesus’, which, as we know, means ‘YHWH saves’. As the Lord led the Israelites out of the slavery of Egypt, so He will lead us out of the slavery of sin, which leads only to hell, and in which our world seems more immersed with each passing day. Convincing a dark world of truth and goodness oft seems an impossible task, but, as the angel reminds the young maiden, nothing is impossible with God.